The Spanish language is a Romance language spoken by about 500 million people around the world. Spanish is the or an official language in 21 countries, and Spanish is the second most learned and spoken language in the United States. Derived from Latin, Spanish is related to Catalan, Portuguese, Italian, French, and Romanian. The Spanish language of Spain is also called Castilian. 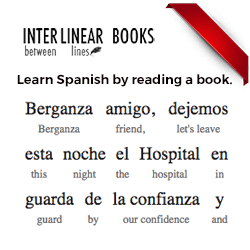 If you're interested in buying books to supplement your Spanish studies, I've recommended some books from Amazon and there is a Spanish Interlinear book with literal English translations under the Spanish text. To download the updated mp3s, please purchase Spanish Language Tutorial! Book Recommendations. Language textbooks are rather expensive and generally only include the formal, written language. You will need more exposure to the real spoken language if you want to be become fluent.